Flower Carved into a Pumpkin This won a prize for being such a pretty design. Winning the prize for the prettiest pumpkin was this flower carved into a pumpkin. It's not too difficult to create a design like this so make sure you find the tools you need to do a little Pumpkin Decorating with these kits we have for sale. The kits come with the pumpkin cutting and punching tools you need and some design templates so you can create an outstanding pumpkin display at your house. You can also use the templates on watermelons in the summer. It's fun to make amazing works of art from pumpkins and melons. 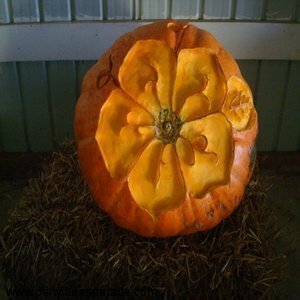 Take a look at the flower we found on a pumpkin in a barn in Salem County, New Jersey. Who knew we would discover some of the most amazing pumpkin carvings out in the country in a barn. The Giant Pumpkin Carve is an annual fund raising event for Meals on Wheels in Salem County, NJ and it's a great day for some simple family fun! I love pumpkins so much that I have named myself the Pumpkin Queen...so if you have any pumpkin pictures why not share them with us and help me keep my self awarded title!